The United States Army awarded BAE systems a contract worth up to $434 million to develop a system that integrates night vision capability and thermal targeting sights onto soldiers’ goggles. The joint project calls for the BAE to work with the Army Night Vision and Electronic Sensors Directorate to create a night vision riflescope that transmits video to a linked set of wearable goggles. "Under the US Army’s Enhanced Night Vision Goggle III and Family of Weapon Sight-Individual (ENVG III/FWS-I) program, BAE Systems is currently qualifying and initiating production of the integrated night vision targeting solution for deployment to the field," BAE said in a statement. Currently, a soldier at night spots a target with night vision goggles and then separately locks in on it with the thermal sight on the rifle. With ENVG III/FWS-I, the idea is to give soldiers a combination night vision and thermal imaging system that not only allows them to quickly spot and engage targets in all weather and lighting conditions, but also to remotely aim their weapons without looking through the sights. "On today's battlefield, this slower [two optic] approach, which is often further hampered by heavy smoke or bad weather, compromises soldiers' safety and can reduce mission effectiveness," the BAE release reads. "By integrating night vision and thermal targeting capabilities into one sight displayed on the soldiers' goggles, BAE Systems' new solution allows troops to more easily acquire targets and engage faster." 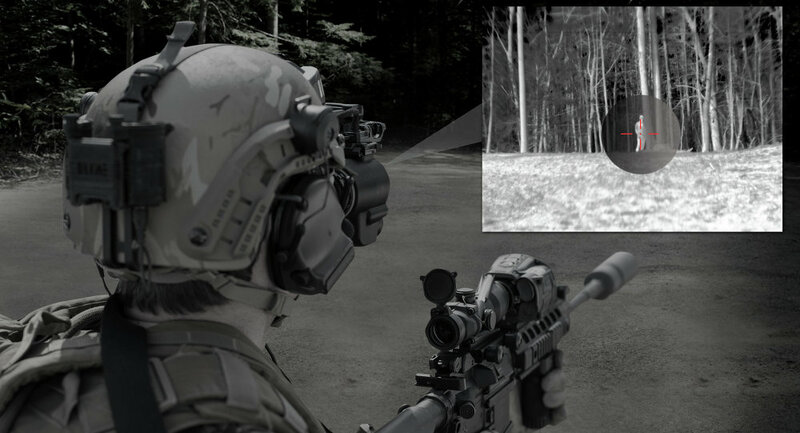 The rifle-mounted optic will use a Bluetooth connection to beam images to a head-mounted display, allowing a soldier to quickly toggle between the two modes at the push of a button. The contract given to BAE Systems for the ENVG III/FWS-I solution is for five years and carries a value of as much as $434 million. An initial order worth $35 million has already been placed.